In the Buddhist Era 2542 (1999) the M.L. Maniratana Bunnag Dhamma Society Fund under the Patronage of His Holiness Somdet Phra Ñāṇasaṁvara, the Supreme Patriarch of Thailand, initiated the Commemorative Pāḷi Tipiṭaka Project, upon request from abroad, to support the printing of the sacred texts of the Buddha’s word in Roman script. The complete 40-volume Roman-script edition of the 25-century old teaching of the Buddhist Theravāda tradition in the orthodox and original Pāḷi language from the B.E. 2500 (1957) Great Internatonal Buddhist Council has never been published before anywhere in the world. This manuscript, known as the Chaṭṭhasaṅgīti Council Edition, the Pāḷi-language text in Burmese Script, was the result of the only Great International Tipiṭaka Council convened in B.E. 2500 (1956) at Yangon by 2,500 erudite Theravāda Buddhist monks from all over the world. Buddhist Heads of States and Chief Representatives of governments from all over the world extended their congratulations to the Great International Tipiṭaka Council in B.E. 2500 (1956). Their Majesties King Bhumibol Adulyadej and Queen Sirikit of Thailand, during their Royal State Visit to Myanmar five decades ago, visited the holy site of the Great International Tipiṭaka Council and offered their homage. This Pāḷi Tipiṭaka manuscript has been considered as the great international and authoritative edition for the Theravāda Buddhasāsana the world over. Consequently, His Holiness the Supreme Patriarch of Thailand, who, himself, attended the Great International Tipiṭaka Council as a representative Pāḷi scholar from Thailand, nominated more than 500 patron, advisor and steering committee members to proof-read and edit the B.E. 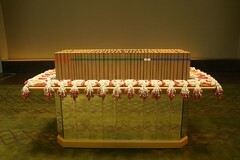 2500 Great International Council Pāḷi Tipiṭaka Edition. The manuscript of the edited Roman-script Edition --The World Tipiṭaka Edition in 40 Volumes-- was published in B.E. 2545 (2002). In preparation of the Roman-scipt text, the Dhamma Society partly based its Pāḷi languge manuscript on two different sources which were presented as gifts of Dhamma to the Dhamma Society. However, the Dhamma Society found that the data from both sources contained significant anomalies and primary printing mistakes. With great care and under rigorous computer-controlled procedures, the project committee decided to undertake anew the proof-reading, including special Pāḷi recitation by canonical Tipiṭaka experts, who recited the entire text 4 times between B.E. 2543-2545 (2000-2002) and B.E. 2549-2550 (2006-2007) to verify every Pāḷi sound and to correct the printing errors of the original 40-volume manuscript. This proof-reading totalled to 2,708,706 words in Pāḷi or 20,606,104 letters in Roman script. In addition, the Dhamma Society, in their proof-reading process, verified the authenticity of the origianal manuscripts and made reference to all the modern 18 editions of the Pāḷi Tipiṭaka in various national scripts of other countries, a reference collection of which totals over 2,000 volumes, which were later presented as a donation to Chulalongkorn University. This International Tipiṭaka Collection is now permanently enshrined in the International Tipiṭaka Hall in the University’s oldest building in Bangkok. This enormous and complicated task, especially the qualitative process, was greatly facilitated by the use of Dhamma Technology, that is, the most advanced Information Technology available, under the control of electronic accuracy and computerized centralization by pious experts. No less than 50-member computer engineering team of the Dhamma Society, for example, utilized over 80,000 hours, requiring 2 years to create the special graphic layout and printing corpus, and additional 3 years or over 20,000 hours to prepare the printing of the World Tipiṭaka Edition between 2003-2005. The first phase of the World Tipiṭaka Database required 4 more years of work between 2005-2009. Quality control was achieved through integration of a multi-disciplinary approach by specialists. The Dhamma Society was blessed with the selfless cooperation of Buddhist monks and nuns, as well as lay scholars in various academic and professional areas from universities and institutions worldwide. One of the important innovative contributions in efficiency and security is the new format of the electronic database, which was created by volunteers from Chulalongkorn University and members of the Dhamma Society who developed and completed the Tipiṭaka Markup, as well as, the Pāḷi Tipiṭaka Database and the Tipiṭaka Studies Reference Database, known today as the World Tipiṭaka Database. As a result of the Dhamma Society’s 12-Year Project, a threefold international standard edition of the Pāḷi Tipiṭaka was published in 2009. The first standard is a Tipiṭaka Publication Standard of the “The World Tipiṭaka Edition in Roman Script”, utilizing the “open-source code” of a universal system of electronic typesetting and “soft-ware” quality programmes. In addition, it is printed in the Roman script and International Phonetic Alphabet, (IPA), which are recognized universally as the most international characters and ones which can be used to replicate the original Pāḷi sounds. The second standard results from the creation of an Electronic Tipiṭaka Open Standard of Pāḷi Tipiṭaka Database, which can be universally utilized by the Information Technology available internationally. The third standard is a Tipiṭaka Reference Standard of the International Tipiṭaka Studies, an approach strictly practiced in the Buddhist Theravāda tradition for over 2500 years, and presented in this edition, which offers the methodology of the Great International Council for proof-reading and publishing both the Pāḷi Tipiṭaka in Roman script and the International Tipiṭaka Studies Reference. A specially enlarged prototype 40-volume Roman-script manuscript of the first edition was first printed in B.E. 2545 (2002). There are 35 categories of project accomplishments and printing innovations which were published by Dhamma Society Fund in the World Tipiṭaka Archives as a supplement to this edition. Project archives for further research and study include 7 editions of the 280-volume drafted manuscripts, about 140,000 pages, 220-megabyte of electronic Tipiṭaka database, and over 500-hour of digital video/audio documentary or 8,000-gigabyte, recording the Project between B.E. 2542-2552 (1999-2009). A special announcement of the Project and its fruition was made at both Buddhist convocations and international academic gatherings at home and abroad between 2002-2003. In 2004, the formal, final announcement was made at the Ministry of Information and Communication Technology in Bangkok, in a special Royal Command Lecture for His Majesty the King of Thailand’s elder sister, Her Royal Highness Princess Galyani Vadhana Krom Luang Naradhiwas Rajanagarindra, who was the Royal Matriarch of the Descendents of King Chulalongkorn Chulachomklao, on the 112th Anniversary Publication of King Chulachomklao the Great of Siam Pāḷi Tipiṭaka Bangkok Era 112 (B.E. 2436/1893), the world’s first printed set of the Pāḷi Tipiṭaka Edition. The special inaugural 40-volume edition in Roman script of the Buddhist Era 2500 Great International Council Mahāsaṅgīti Tipiṭaka Buddhavasse 2500 (The World Tipiṭaka Edition) was finally published by the Dhamma Society in B.E. 2548 (2005). These special inaugural sets were graciously presented during the same year as a royal gift from Thailand by Her Royal Highness Princess Galyani Vadhana, the Honorary President of the Tipiṭaka Presentation worldwide, thereby following the donation of the past royal gifts of Tipiṭaka for no less than 260 institutions in over 30 countries worldwide by her grandfather, King Chulalongkorn Chulachomklao the Great of Siam. Vice-Chancellor of Uppsala University (Professor Bo Sundqvist), for the Kingdom of Sweden, representative institution of the western world, and is now preserved at the Book Hall, the Carolina Rediviva Library, Uppsala University, the Kingdom of Sweden, 13 September B.E. 2548 (2005). In addition to the printing edition, the World Tipiṭaka WebService was made avilable on the Internet as a gift of Dhamma in 2008. Since 2009, a record has indicated that, internet users from over 100 countries worldwide have accessed to the eTipiṭaka provided by the Dhamma Society & the World Tipiṭaka Project. The first digital printing of the World Tipiṭaka in Roman Script from the World Tipiṭaka WebService was also available for institutional request, thereby eliminating the information cost of the Tipiṭaka Wisdombase and thus making the Wisdom Heritage of Humanity in the Tipiṭaka more accessible to a greater number of people than ever before. The Personalised Digital Tipiṭaka Printing and the Electronic Tipiṭaka will be made available after the Celebration of the Buddha’s Supreme Enlightenment in B.E. 2554-2555 (2011-2012). Since 2005, many institutions worldwide have formally requested the World Tipiṭaka in Roman Script from Thailand. In 2010, more than 40 leading international institutions in 20 countries have been presented as a royal gift of Wisdom & Peace with the World Tipiṭaka in Roman Script (40 vols. ), including the Tipiṭaka Studies Reference (40 vols.) and the Chulachomklao of Siam Pāḷi Tipiṭaka 1893 : A Digital Preservation Edition 2010 (40 vols.). In the future, the 40-volume World Tipiṭaka in Roman Script will be presented as a royal gift from Thailand to the international institution which has made a formal request to the World Tipiṭaka Foundation and the M.L. Maniratana Bunnag Dhamma Society Fund under the Patronage of His Holiness Somdet Phra Ñāṇasaṁvara, the Supreme Patriarch of Thailand. Priority will be given to institutions which are supportive of wisdom and peace education or institutes which had already received the Chulachomklao King of Siam Pāḷi Tipiṭaka in Siam-Script Edition in the past and is well-preserved until today.